Bilaspur, a city in the Bilaspur district of Himachal Pradesh, lies at the foot of Bandla Hills. Majority of the population lives in villages and earns its living through farming. Though Bilaspur fairs well in terms of literacy rate, the condition of health is quite disheartening. The average distance between the villages in the hilly terrains of the district is around three to four kilometres. But due to the lack of transportation facilities, covering even this small distance becomes tougher. Due to lack of proper medical services, the inhabitants have to travel 25-30 km. The government health facilities that are available in the region are not enough to cater to the increasing population. Moreover lack of resources, poor infrastructure and shortage of trained doctors makes the health situation more dismal. People living in the district are left with no option but to consult private doctors, who charge a high fee that not everyone can afford. Smile Foundation along with Infrastructure Leasing & Financial Services Limited, planned to bring the joy of good health in the lives of the people living in Bilaspur. They pledged to provide them with facilities necessary to uplift the dismal health situation in these villages. The aim was to provide preventive, promotive and curative health services at the doorsteps of the underprivileged population in the region. In December 2014, Smile Foundation launched Smile on Wheels project in Bilaspur to help cure the people suffering from prolonged ailments and also spread awareness among people regarding issues of health and hygiene. The project covered 42 villages in the district. As a part of the programme several OPDs are organized where people are made to undergo medical check-ups and pathological tests, if required. While working in these villages Smile Foundation’s team had to overcome social stigmas and reach out to a large part of the rural population. Women and children being the most vulnerable were given extra attention under the project. 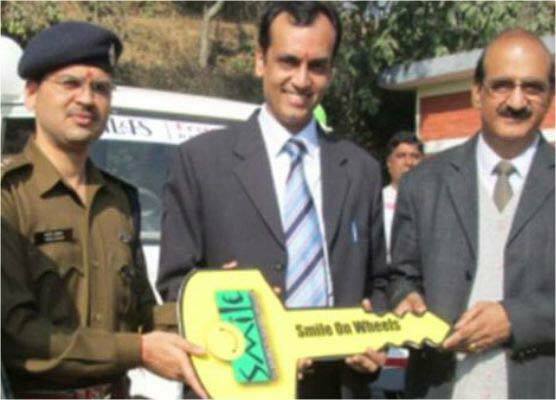 A total of 42 villages covered under Smile Foundation’s ‘Smile on Wheels’ initiative. The beneficiaries included the weaker sections of the society like women, elders and children. After conducting medical checkups and lab tests, free medicines provided to the patients. People were treated for 15 different diseases in the reporting period. A record is also kept of the prevalent diseases in the region in order to provide better medical guidance to the inhabitants. The project also acts as a bridge between the community needs and government services by bonding with government hospitals, which provide medical services at affordable prices to the beneficiaries. Information, Education and Communication is another important aspect of ’Smile on Wheels’ Bilaspur program. Activities include conducting awareness programmes to sensitize the community on healthier practices. Specialized health camps conducted in order to reach to a grater part of the population. 2912 PATHOLOGICAL TESTS WERE CONDUCTED SO FAR.